Numbering just over 100 members, the choir performs regular concerts at St Albans Abbey and other venues in the city and surrounding area. We are known for our friendliness and sociability and for our high standard of singing. If you enjoy singing, have some musical experience (even if it’s from school days), and can sing in tune, why not come along and try us out? We welcome singers from all backgrounds. You will be sure of a warm welcome and an uplifting musical experience from our inspiring music director, George Vass. You are welcome to contact us anytime. 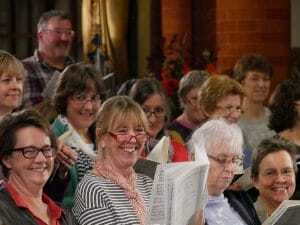 Click here to listen to some of our members talking about life in the choir, and to hear some music from our rehearsals. Entry into the choir is by a voice test and the annual membership is £180, which can be paid in instalments. We rehearse on Thursday evenings, 7.40pm-9.45pm, from September to early July, at Dagnall Street Baptist Church. Members are expected to attend rehearsals regularly, and to help promote our concerts to family and friends.